The so-called national political consensus was translated into a 20-point National Action Plan (NAP) unanimously approved by Parliament on 24 December 2014. The plan required, among other measures, the formation of military trial courts to deal with terrorism-related cases and lifting of the ban on the death penalty in such cases. As part of the plan, the Parliament and President hastily approved two extraordinary pieces of legislation on 6 and 7 January 2015, notably the Constitution (Twenty-First Amendment) Act, 2015 and the Pakistan Army (Amendment) Act, 2015. On 9 January 2015, Pakistan lifted the moratorium on the death penalty. These extraordinary measures have had serious implications for human rights of accused persons facing military trials. The Pakistan Peoples Party (PPP), one of the two largest opposition parties, and national and international human rights organizations have strongly condemned the expected move. The Co-chairman of PPP, Bilawal Bhutto Zardari, has vowed to oppose it. Another senior leader of PPP, Farhatullah Babar, recently stated that the ‘extraordinary circumstances’ have ceased to exist and there was no justification for ‘extraordinary laws’ to continue. He warned that repeated exceptions to the general laws of the land create permanent vested interests which thrive on their continuation. He also pointed to the dangerous nexus between military courts and the issue of missing persons. Military courts, he claimed, provide cover to enforced disappearances by showing that persons missing for years were, in fact, facing the military trial court. The proceedings of military courts have been kept secret. Until recently, there was not sufficient information in the public domain about their procedures and workings. The only source of information has been media statements of the Inter-Services Public Relations (ISPR) – the media wing of the military – announcing the award of capital punishments by military courts and containing vague references to the alleged involvement of the convicts in militancy without specifying the nature or extent of the convicts’ purported role in the acts of terrorism ascribed to them. However, on 18 October 2018, the Peshawar High Court (PHC) in a single judgment overturned some 70 convictions (mostly death sentences) awarded by three military courts in the province of Khyber Pakhtunkhwa on 10 October 2018 for lack of credible evidence and that convictions suffered from ‘malice’ of law and facts. The decision of the PHC for the first time provides an authoritative insight into the working of military courts. For example, the court observed that all convictions in those cases were based only on confessions, without independent and unimpeachable evidence to prove the guilt of the accused beyond reasonable doubt. Prosecution witnesses in all those cases were informants and none had directly witnessed the presence of any convict on the scene of occurrence. Confessional statements and statements of prosecution witnesses in all cases were similar in all details except changes of dates, places, and names of individuals. All confessions in three different military courts were written in the same handwriting, language, text, tone, and tenor. The court also observed that quite surprisingly in all cases the convicts refused to engage private defense counsels of their choice and instead agreed to be defended by a ‘private’ counsel selected by the prosecution at state expense. Only one defense counsel with five years’ experience from another province was engaged who could not speak the language of those he supposedly defended. The defense counsel declined in all cases to cross-examine prosecution witnesses testifying about the character of the accused. None of the accused deviated from the principal stand of the prosecution and none answered the prosecution questions differently. All convicts were kept outside the court while proceedings went on behind their back. The court made a startling revelation that for relatives almost all convicts were ‘missing persons’ for a long time – ranging from six months to eight years! After years of detention, the convicts were suddenly produced before military courts where they ‘confessed’ to terrorism-related crimes. Relatives of most the convicts were never informed at any stage that they were alive and facing trial proceedings before the military courts. In 45 cases, the relatives came to know about the convictions through newspaper reports. The Director General of ISPR has recently remarked that the previous civilian government decided on its own to empower military trial courts to decide terrorism-related cases. The fact of the matter is that demand for military courts always came from the military. Given the military’s dominance over all civilian institutions, the 21st and 23rd constitutional amendments were forced down the throat of the government. Resistance to military pressure was not forthcoming because no civilian government can stand up to the powerful military. 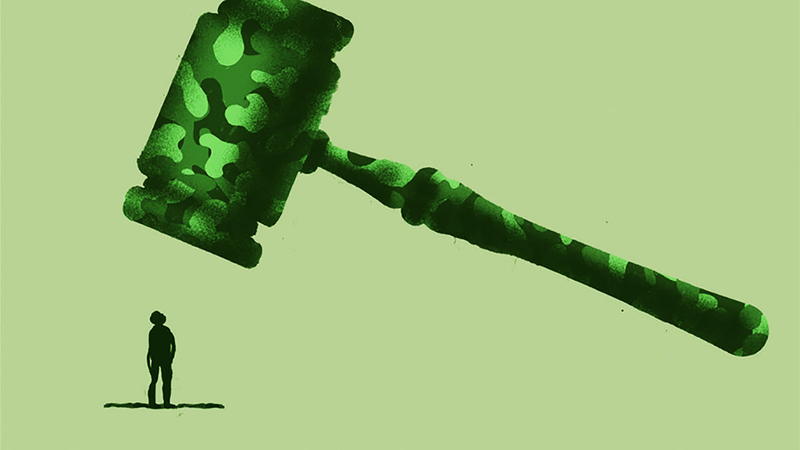 The recent refusal of PPP to grant the second extension of military courts is a welcome sign. However, the PPP had similarly initially refused to give the previous constitutional amendments extending the military courts but changed its position later on. It is neither difficult nor uncommon for the military to make leaders of political parties forge a ‘national political consensus’, who otherwise remain at loggerheads with each other over every other issue of national importance. The elephant in the room, which hardly gets mentioned in the debate, is the fact that the military is part of the problem and for that reason cannot be a part of the solution. The rise of extremism and terrorism in Pakistan is mainly due to the military’s control over foreign policy towards its neighbors, especially India and Afghanistan. The policy relies heavily on the use of what is commonly known as the ‘good militants’ that attack and destabilize the said countries, as opposed to the ‘bad militants’ that attack the army and mainland Pakistan. It is the ‘bad’ militants that have become the target of military operations and stand trials, if at all, before military courts. While approving the formation of military courts for the first time, many parliamentarians, without naming but in clear reference to the Pakistan army, urged the military to abandon the policy of making distinctions between good and bad militants if the country is to get rid of the scourge of terrorism. Unfortunately, nothing has changed in that regard. One of the greatest problems the country has been facing is the issue of missing persons or enforced disappearances. The military intelligence agencies have been accused of disappearing many Pashtun residents from Khyber Pakhtunkhwa, PATA, and the erstwhile FATA. This has given birth to the Pashtun Tahaffuz Movement (PTM), a new movement that is demanding the security of Pashtuns from the military. It has jolted the hitherto unchallenged military establishment and called for rolling back the latter’s destructive policies. The massive public demonstrations of PTM always reverberate with the slogans ye jo dehshat gardi hai, iske peeche wardi hai, which literally means ‘the army is behind terrorism’. Under pressure from PTM, the military has reportedly released almost a thousand missing persons from the internment centers maintained by the security agencies where they were kept and tortured for years. One of the main PTM demands has been for the military to produce the missing persons before the regular courts of law to stand trial. If the military is accused of being ultimately responsible for promoting extremism and terrorism, it cannot and must not be allowed to become a judge in its own cause, selectively going after some and simultaneously supporting other militants or militant groups. The civilian political leadership has to gather courage, stand up to the army and assert its control over domestic and foreign policy. It must draw strength from and support popular movements such as PTM that stand for the supremacy of the constitution and the rule of law. It has to address the root cause of terrorism and at the same time bring reforms in the criminal justice system. As DAWN, a prominent newspaper has rightly noted in its recent editorial, ‘The fight against militancy, terrorism and violent extremism will of necessity be long. But the country must not lose its constitutional, democratic and fundamental-rights moorings in the process’. Dr. Muhammad Zubair served as Assistant Professor of Law at the University of Peshawar, Pakistan. He recently completed his Ph.D in Law and Democracy at the Maurer School of Law, Center for Constitutional Democracy, Indiana University Bloomington.